Our education systems are broken. This is not new news, nor is it surprising; many countries have failed to really “update” their education systems at all over the last fifty to one hundred years, instead allowing the world to march merrily on and leave the educational foundations lingering in the era of factory-line production. Herein lies the issue so many students across the world are facing – their education system is training them to be robots: teaching them to follow a system in which they are trained to follow orders, absorb information and amalgamate amongst the masses. Critical thinking, individual development and creativity are so often pushed to the side-lines in favour of standardisation, regulation and target-driven quality control. Asking questions is one of the most powerful tools that we, as individuals, can wield in the world. Questioning what we are told - what is being presented to us as fact - is vital in this ever-changing world, where the microphone is given to anyone with the internet and an opinion, and where “facts” no longer need to be true. However, so often, learning within a formalised school system isn’t able to give students the time or space to think for themselves and question the world around them. They are certainly not given the time to contemplate what they are learning; what it may mean to them and why it is being taught. Time is a limiting factor within classroom learning and often reflection is left to the students to do elsewhere. The question “Why?” may well be one of the most important words which we use: it allows us to stop, reflect, consider and respond with meaning and understanding, and yet this is something that our education systems rarely encourage. Head down, absorb and regurgitate – no questions asked – seems to be our current route to pedagogical success. ThoughtBox has been created to challenge this system. Our education philosophy believes in the importance of critical thinking: challenging students to “unlearn” stereotypes and assumptions and allow new understandings of seemingly familiar issues to emerge. Developing a series of weekly lessons focusing on global topics - with students encouraged to ask questions, rather than learn answers - ThoughtBox is an online curriculum with a vision to encourage critical thinking, empathy and global tolerance; a product of one teacher’s frustrations at the limitations of the education system in which she was working. The fundamental importance to us all, as individuals, to be able to think for ourselves and to question the world around us is built into all of the curricular - designed without a rigid end goal; simply as a tool to engage students’ minds. Being able to look at an issue and pause, reflect and consider a range of views is a tremendously valuable skill. Understanding that there is often no “right way” to see something is part of empathy building and a way for us to learn to tolerate difference in opinion and belief. Learning in formal lessons often has an end goal; a “right answer” or a correct way of seeing things. Yet in reality, life just isn’t like that. Every day there are a hundred thousand answers to our potential questions; each of us channelling our own thoughts about what is right, what is wrong, which way is up, which way down. ThoughtBox allows students to see the world through different eyes; to challenge feelings of empathy and to encourage new ways of thinking. Building empathy is a vital skill for a globalised world; being able to live harmoniously within our ever-globalising environment being crucial to a successful future. 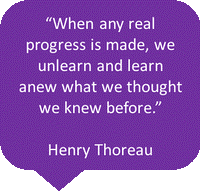 Unlearning is a skill that we all need to practise. This style of learning is one of the most crucial ways for us all to live, grow and adapt successfully with the rapidly changing world. There is no shame in changing your mind: no negative in casting aside old knowledge when it needs to be ‘updated’; no failure in re-learning how to see the world. In fact, in many ways it is a sign of wisdom to be able to have the courage to re-think and change our thoughts. After all, there is no finality when it comes to thinking and learning.